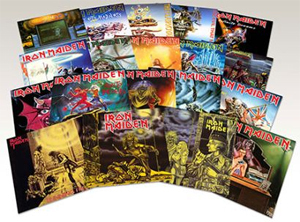 Parlophone Records (BMG/INgrooves Music Group for North America) followed the 2012/13 IRON MAIDEN vinyl picture disc reissues of the first eight IRON MAIDEN albums, which spanned the 1980s, with brand new pressings of the albums in heavyweight 180g black vinyl. In conjunction with these premium album releases, a strictly limited one-off run of the 7” singles from each respective album will be made available. These highly collectable black vinyl singles were from the original analogue master tapes. Released in replica artwork packaging, they will become a must-have item for fans, collectors and anyone who missed out first time round. The albums are also cut from the original analogue master tapes and packaged in identical artwork to the initial 1980’s releases. As a bonus, the first batch of album releases (Iron Maiden/Killers/The Number Of The Beast) are available in a Collector’s Box sized to house all eight albums. This package will be a strictly limited edition and available while stocks last. "Running Free" b/w "Burning Ambition"
"Women In Uniform" b/w "Invasion"
"Run To The Hills" b/w "Total Eclipse"
"Flight Of Icarus" b/w "I’ve Got The Fire"
"The Trooper" b/w "Cross-Eyed Mary"
"2 Minutes To Midnight" b/w "Rainbow’s Gold"
"Aces High" b/w "King Of Twilight"
"Wasted Years" b/w "Reach Out"
"Stranger In A Strange Land" b/w "That Girl"
"Can I Play With Madness" b/w "Black Bart Blues"
"The Evil That Men Do" b/w "Prowler ‘88"